I have finally gotten one of our rooms to the point where I'm ready to share. It's still a work in progress, but I'm pleased with what we have done so far. When we moved in, the living room along with almost every other room in the house was painted a green/grey/brown color. I wasn't the biggest fan of the color, but it wasn't terrible either. I think we would like to repaint in the long run, but for now the color will do. Overall the room had good bones. The paint is in decent shape, despite how many people have moved in and out of this starter home in the last decade. Hardwood floors throughout, and cornices over each window. 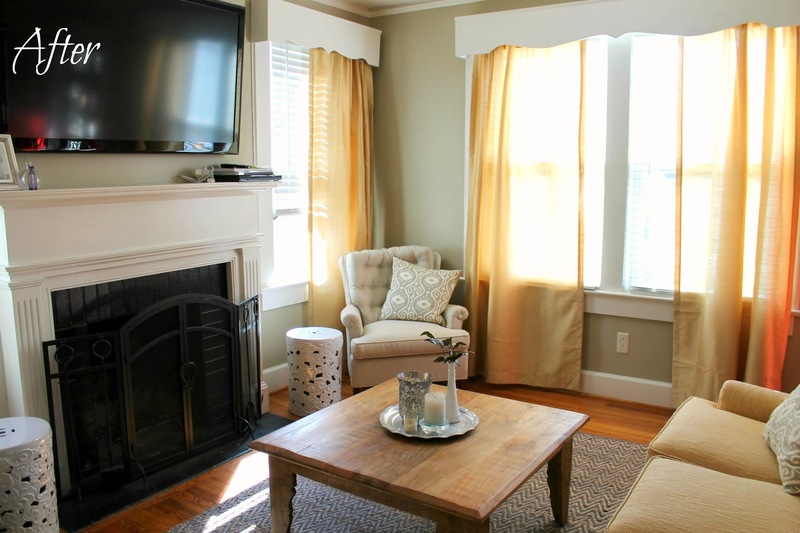 I love the charm that cornices add, plus it makes hanging curtains super easy. The hardware was already installed inside each box, all we had to do was place the curtain rod inside each cornice. Here is a picture of what the room looked like the day after we closed. 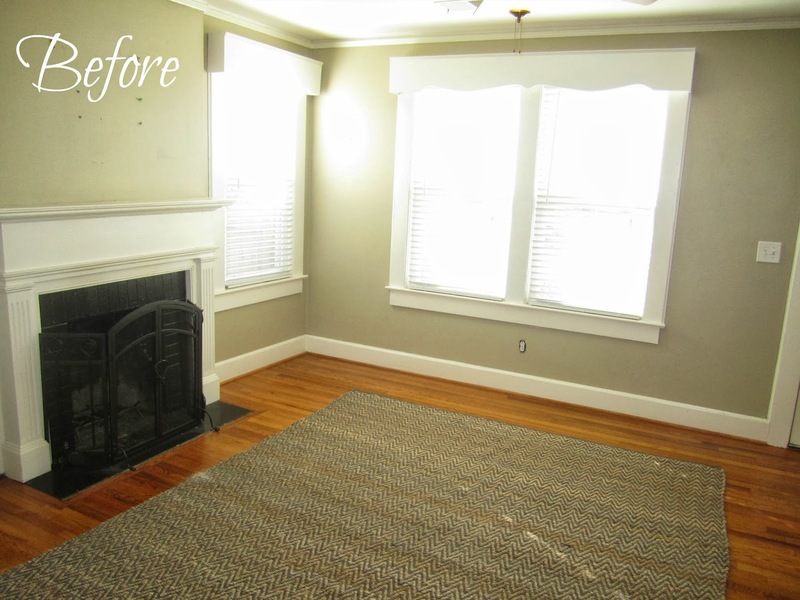 The rug you see is ours, we were just to eager to get started on this room. The biggest purchase we made for this room was the rug. We chose this one from West Elm. Luckily I already had a lot of the furniture that we used in here. I used the couch that I had in college, and the chairs came from an estate sale years ago, I just had them recovered in an unbleached linen. The only things I purchased were the two garden stools from World Market, the mirror from Home Depot, and the coffee table from TJ Maxx. At this point there are no storage pieces in the room, that's the one thing we're trying to figure out. We currently have our laptops and iPads stacked up on the mantel, but it just looks a little too messy for me. I've been working on a priority list for each room of the house. The den needed the least work, so this list isn't too daunting. Here's what we've got. Now I need y'alls help on the wall with the sunburst mirror. It just looks a little lonely up there. Any ideas on how I could fill that wall up? I would love to hear your suggestions. Your room looks great! We have a similar setup with the tv over the fire place. I always had the hardest time figuring out what to put on the mantle without it being too much. Your curtains look awesome! You did a really good job! What if you moved the mirror somewhere else and put a tall, narrow white or off white bookcase there instead? You could probably find a cheap one on Craigslist and give it a distressed look with chalk paint. You could also get a few baskets to put on the bookshelf to store your laptops/ipads in when you're not using them. Plus, it's always fun to decorate the shelves in a bookcase. House looks great! We've been in our house almost three years and my list just grows and grows! I LOVE your front door and always wanted that fancy kind of storm door on a house! This room is so cozy!! Wow! Great job, it looks so pretty! I agree that it looks so cozy. I bought that mirror for my daughter's room. I love it. Maybe different size frames, your last initial letter, a key to symbolize your new home to make a gallery wall?? I love your home! Your decorating style is so chic and cozy. I would consider a small table that had some type of storage for underneath the mirror. Whatever you choose, I am sure it will look great! I love what you've done with it- the colors are so soothing! Curtains are still on my to-do list but I'm having the hardest time deciding color, pattern or not, etc. 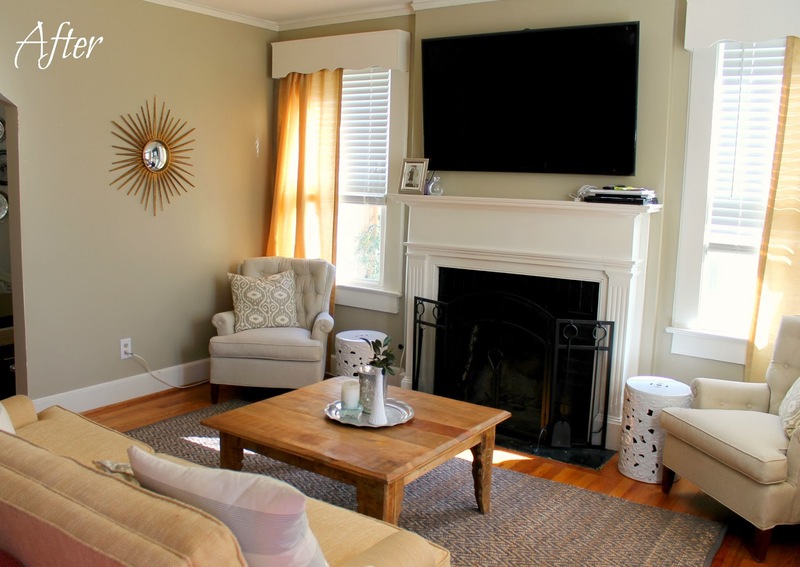 Could the mirror go to the right and leave room for some white staggered wall shelves? I'm seriously IN LOVE with this! You did such a great job. I wish I had some suggestions, but I am so not an interior designer! I love this room! 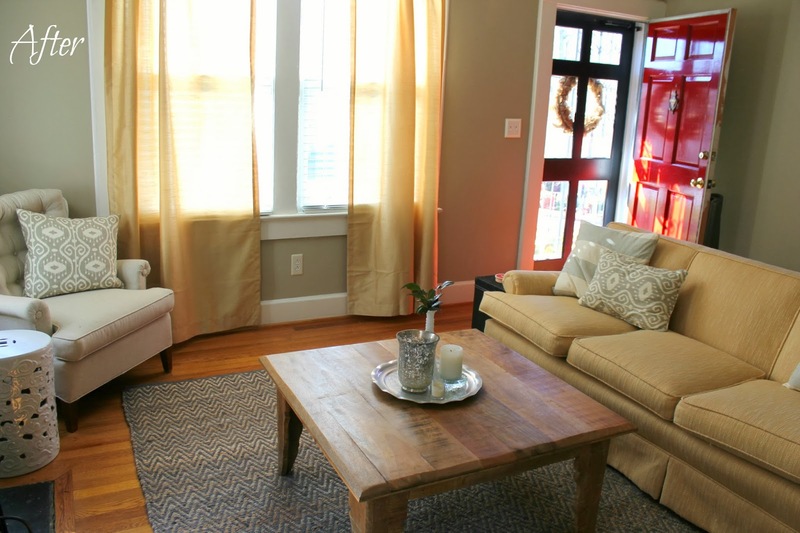 All the windows are awesome and the red front door adds so much character! I think the paint in most of our house is a similar tan/grey/grey color too. Just like you, we don't hate it enough to change it right away but probably will somewhere down the line. So when I saw the picture in your most recent post I thought it might be from a catalogue until I read the post. How gorgeous. How do you like the west elm rug? I have one from overstock which fit into my really low budget but a year later is really showing wear. Love the before and after pictures! You did a great job with everything :) I'm not an interior designer, but I think it would look really nice if you turned the mirrored wall into a gallery wall. Add a few frames (pictures or wall art) and a monogram letter for your name/your husbands name/your last name etc. That would probably be my choice. Or if you want less on the wall, I wonder how it would look if you moved the mirror slightly higher and added a shelf or two below it?